3D scanners categories. 3D scanners can be classified in several categories, depending on their design, technical specifications, and fields of applications. In this article, we break down the different types of 3D scanners and explain how they work, what are the differences between the different 3D scanners categories and how much 3D scanners cost. From desktop 3D scanners to handheld 3D scanners and industrial metrology systems and even 3D scanning mobile apps for your smartphones, discover the full array of 3D scanners available on the market. Note: we do not categorize 3D scanners based on the 3D scanning technology they use. Desktop 3D scanners are designed for 3D scanning small to medium size objects and have a footprint which allow to fit on a desktop. Closed-frame desktop 3D scanners: with their enclosed 3D scanning chamber, these 3D scanners offer an environment where light is controlled and are ideal 3D scanning applications in jewelry or dental for example, where a high scanning resolution is required. These enclosed 3D scanners basically look like a box connected to a computer, in which the user can put the object to be captured in 3D. Open-frame desktop 3D scanners: these 3D scanners are more flexible in terms of 3D scanning area but in most cases they must be used in a room with constant and not too bright lighting. Many desktop 3D scanners are composed by a light projector or cameras mounted on a tripod for stability and accuracy. 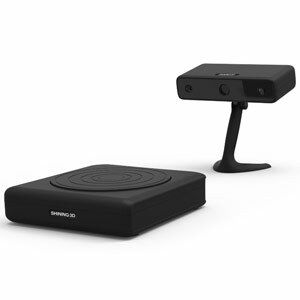 Desktop 3D scanners usually come with a turntable on which the object to be scanned can be positioned. During the 3D scanning process, the turntable rotates while the 3D scanner remain in a fixed position, thus allowing the object to be captured in 3D from all angles. The 3D scanning turntable is usually connected to the 3D scanner and operated from the 3D scanner software. 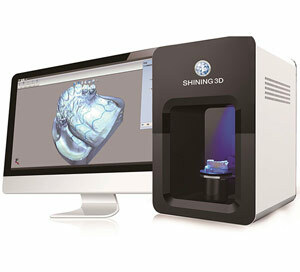 Desktop 3D scanners typically use the structured light or laser triangulation 3D scanning technologies. They can be used for medical applications (dental, hearing aid), reverse engineering, entertainment, jewelry or prototyping applications among others. Desktop 3D scanners prices can range from a few hundreds euros for entry-level machines, to tens of thousands of euros for advanced professional-grade 3D scanners. 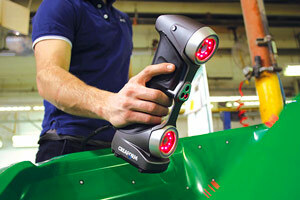 Portable 3D scanners and handheld 3D scanners are designed to be carried and operated by hand. The operator holding the 3D scanner points it at the object to capture it from different angles and obtain a 3D model of the object. Handheld 3D scanners are more flexible and versatile than fixed 3D scanners (tripod 3D scanners), as the user can for example access scanning areas difficult to reach. Portable 3D scanners can capture in 3D objects of various sizes, from tiny objects and intricate details to human body or even cars and larger objects. Most portable 3D scanners can capture textured and colors to obtain photorealistic 3D scans (depending of course on the resolution offered by the 3D scanner). It is important to keep in mind that despite being portable by hand, most of these 3D scanners are not wireless as they need to be connected at any time to a computer via USB and to a power plug. The mobility is thus restricted. Only a few portable 3D scanners are fully wireless. Professional 3D scanners and industrial 3D scanners are designed to meet high standards of precision and details, for professional applications such as precision measurement and metrology, product design, inspection among other use cases. 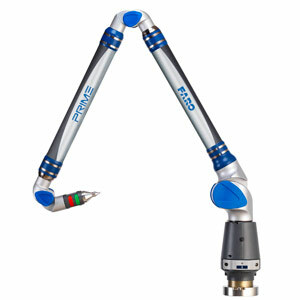 3D scanners specifically designed for precision measurements are also called Coordinate Measuring Machines (CMM). Industrial 3D scanners come in a wide variety of shapes to address specific uses cases. The most common are reverse engineering, part inspection and maintenance. Industrial-grade 3D scanning systems can leverage many different 3D scanning technologies, sometimes in combination, to offer the best possible performance. They do not usually capture the textures (colors) of objects as they are designed to capture shapes and generate highly detailed mesh made of dots. These professional 3D scanners are usually quite expensive 3D capture systems and can be composed of several items (calibration units, markers, 3D scanning heads, robotic arm etc). Their price can range from a few thousands dollars to tens of thousands of dollars for advanced systems made for demanding industrial environment and applications. In this category are classified the devices and system able to 3D scan human bodies and human body parts (face, hands, feets, full limbs). The body 3D scanners most common designs are either huge cabins, where the person to be 3D scanned is surrounded by sensors, or a couple turntable with a fixed sensor. They are able to 3D scan in color (with textures) a full person in a few seconds. The 3D scanning technologies are photogrammetry (fast but requires a lot of cameras and/or photos) and structured light (better resolution but requires the subject to stand still for some time). 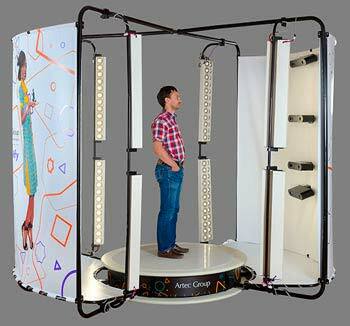 The body 3D scanners are used for medical (prosthetics, orthosis,), fitness or fashion applications. 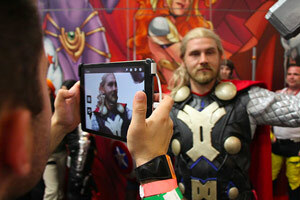 They are also very popular for producing detailed 3D scans which can be 3D printed into 3D figurines. Some portable 3D scanners can be used as body scanners but their architecture will make them fall in the Portable/handheld category. A person getting 3D scanned Credit: makezine.com. In this category are classified the software which can perform 3D scans one installed on affordable hardware such as smartphones and tablets. The 3D scanning applications rely on the device sensors they are installed on. 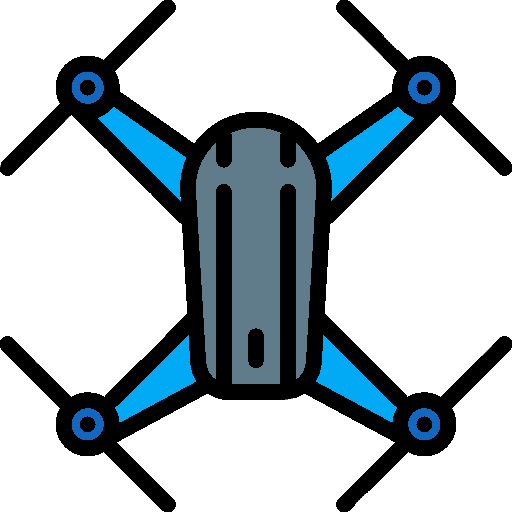 The most common technical solution is to use the camera and inertial sensors of a smartphone to record photogrammetric data before turning it into a 3D scan in color (with a texture). The overall performance of the system depends on the camera resolution and lighting conditions. Moving subjects and small subjects are really hard to 3D scan. Check out our list of the five best and free 3D scanning mobile apps to get started!